Looking for designer handbags with slashed prices? If so, Designer Handbags Rescue and their new Big Commerce store is a must-shop online handbag wonder world! OC Designs Online helped make their ecommerce shop stand out with a unique and eye-catching Big Commerce store design with tons of tools to help shoppers find the right designer handbag at the right price! This Big Commerce store is owned by a mother-daughter team based in Cincinnati Ohio and what they do to offer these designer handbags is something we all wish we could do only they make it look easy! 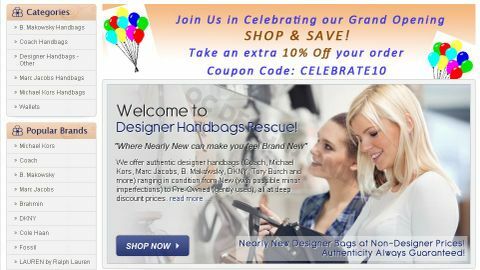 They simply work with authorized vendors and department stores and purchase their shelf pulls, display bags and bulk-lot customer returns and in turn, sell the at deeply discounted prices at Designer Handbags Rescue. For this Big Commerce store design we took advantage of the top menu by offering their logo and a catchphrase: “Where nearly new can make you feel brand new.” We also inserted a link to their Facebook Page, a search the store tool and because this mother-daughter team also has a sister store, Chateau Le Beau, we offered a link to that store for even more potential customer sales. We also included the standards; tabs for Authenticity/About Us, Contact Us, and Shipping and Returns—must-have tabs to build buyer confidence. Drop down and you’ll see great imagery and a discount offer (which can be edited as needed) and to the left side, a shop by categories or popular brands menu. These side bar menus are essential in all Big Commerce store designs as they help to narrow down the search for busy online shoppers. Further down, you can also shop by featured products using clickable boxes with an “Add to Cart” feature. A place to sign up for their company newsletter is also to the left along with important information on shipping; free priority shipping on all sales over $100 and the promise of fast-shipping, an important sales tool for any Big Commerce store design. Finally for the bottom of this ecommerce store, we included text on “Why Buy From Us,” “About Us,” “My Account,” and “Customer Testimonials” which are a great way to build trust with consumers. 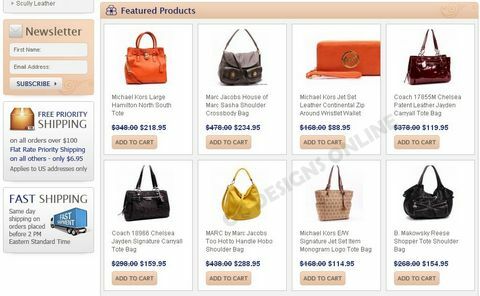 Lastly we included the types of payment Designer Handbags Rescue accepts and included that they are PayPal Verified. Are you considering Big Commerce for your ecommerce store? If so, let OC Designs Online show you our expertise in creating stand-out Big Commerce store designs. Simply Request a Quote and don’t forget to browse our Big Commerce portfolio.